In preparation for this, we will be switching over to a backup connection Thursday, March 1, at 6am and remaining on the backup connection for the duration of the maintenance. Most services should not be disrupted though we may see some degraded performance during heavy use times. 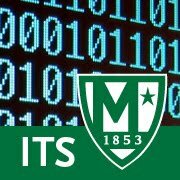 Late in the week of February18th, the ITS department was notified of malware that had been installed in many of the computer labs. The malware was investigated and found to be a crypto currency miner that had been installed via unauthorized access to the lab machines. After analysis, we do not believe any risk was posed to other accounts or users. The malware has since been removed, and we are in the process of re-imaging the labs to be on the safe side. The method by which the attacker gained access has been closed and ITS is working to ensure this does not happen in the future. We apologize for any inconvenience that this has caused. See this article highlighting how Manhattan College ITS utilizes Student Employees. UPDATE: as of 7:45am, this maintenance was completed successfully. ITS will be testing our backup Internet Service Provider (ISP) connection Tuesday, February 27, 2018 from 6am-7:45am. This testing is to prepare for the main ISP outage occurring on March 2, starting at 9pm. This planned network maintenance will cause brief network outages for both the wired and wireless networks throughout the campus. This will be the last test before the main ISP outage occurring on March 2nd. This testing is to verify that our backup ISP will work as intended for the duration of the maintenance period from 9pm March 2 until 9pm March 3. UPDATE: The network maintenance was completed successfully by 7:35am. ITS will be testing our backup Internet Service Provider (ISP) connection Tuesday, February 20, 2018 from 6am-7:45am. This testing is to prepare for the main ISP outage occurring on March 2, starting at 9pm. UPDATE: At about 11:15am, this network maintenance was completed successfully. Physical Plant will be conducting a generator test in Horan Hall Tuesday, February 20th at approximately 10am. O'Malley 100 now has the option of a different orientation set up to accommodate the new projector screen. If you wish to use the screen for a presentation, the chairs are set up facing the left wall as you enter the room. The room is an excellent gathering place as it holds up to 75 guests. Click on link O'Malley 100 Podium Guide for more details. The moodle system is currently offline for emergency maintenance. We expect the maintenance to last less than one hour.